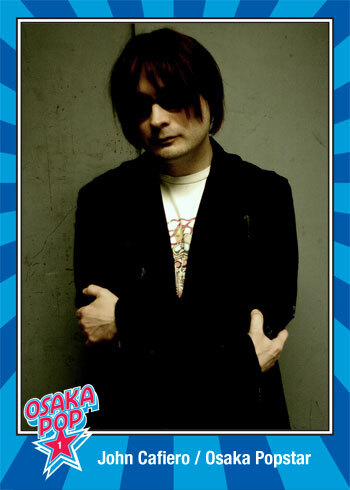 Osaka Popstar is the pop-punk multimedia music and art project led by singer/producer John Cafiero, long-time Misfits & Ramones collaborator and platinum selling film and video director. 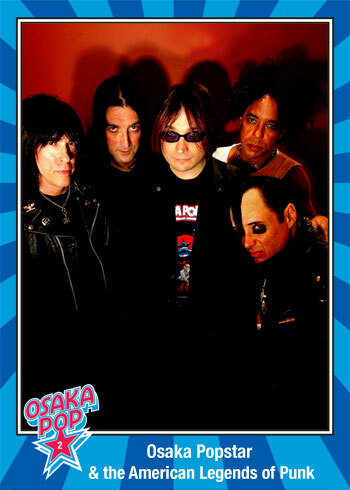 The critically acclaimed debut album “Osaka Popstar and the American Legends of Punk” as well as the live follow-up “Rock’Em O-Sock’Em Live!” features frontman Cafiero with a revolving lineup of punk-rock legends as his backing band including members of the Misfits, the Ramones, Black Flag, the Voidoids and more. Recent Osaka Popstar releases feature frontman Cafiero on vocals, with Dean Rispler (Voluptous Horror of Karen Black, The Dictators) on Guitar and Bass, Jon Wurster (Bob Mould, Superchunk and The Mountain Goats) on Drums, as well tracks including “Fish Heads” and “Pico & Sepulveda” from the “Dr. Demento Covered in Punk” compilation, (and prior singles “Hopping Ghosts” and “O Holy Night”) featuring Sal Maida (Milk ‘n’ Cookies, Roxy Music) on Bass, and Dennis Diken (The Smithereens) on Drums. Osaka Popstar transcends punk rock, comic books, and anime themes beyond music alone with limited edition vinyl toy releases, collaborations with Topps, (having appeared in their Garbage Pail Kids & Wacky Packages series), and more. Animated Osaka Popstar music videos have even debuted on the Nintendo 3DS gaming platform under license to Nintendo. Cafiero’s longstanding collaborations with the Misfits remain consistent two decades deep on both a creative and business level. Among other endeavors Cafiero edited the acclaimed book “Commando: the Autobiography of Johnny Ramone”, Directed the chart topping “Ramones Raw” documentary, and the modern day cult-classic feature film “Big Money Hustlas” starring the Insane Clown Posse, Rudy Ray Moore (aka “Dolemite”), WWE’s Mick Foley, comedian Harland Williams & the Jerky Boys. In addition to managing the legendary Misfits (currently headlining arena shows reuniting Original Misfits co-founders Glenn Danzig & Jerry Only), Cafiero also manages the Estate of Dee Dee Ramone (of the world famous Ramones). When the Ramones received a lifetime achievement Grammy Award in 2011, Cafiero had the honor of accepting and speaking on behalf of the late punk icon at the awards ceremony. Cafiero has produced music by everyone from punk icons like the Misfits, to pop icons like Ronnie Spector—and most of the artists/tracks appearing on “Dr. Demento Covered in Punk” as well. JOHN CAFIERO is the creative force behind Osaka Popstar and this ultra punk pop masterpiece. A long-time collaborator of the Misfits (among other smash hits he produced their visionary Project 1950 record, the highest charting Misfits CD ever), Cafiero grew up in the stellar orbit of the Ramones and the heroic army of first wave New York City punk rockers. Joining him on Osaka Popstar’s debut mission — the AMERICAN LEGENDS OF PUNK, including Jerry Only (THE MISFITS), Dez Cadena (BLACK FLAG), Ivan Julian (RICHARD HELL & THE VOIDOIDS) and Marky Ramone (THE RAMONES). Cafiero taped into his diverse pool of friends and collaborators to assemble a line-up that would include an impressive pedigree of punk rock musicians for Osaka’s debut-backing band. Future releases will continue the theme as new guests and revolving line-ups join the fold and contribute to the project lead by Cafiero. In 2006 Osaka Popstar released the critically acclaimed debut LP, appropriately titled Osaka Popstar And The American Legends Of Punk. For the album Cafiero picked an eclectic mix of cover songs to complement his originals, resulting in 13 tracks of addictive, high-energy punk pop plus a bonus DVD featuring animated videos. “This is a combination of everything that has inspired me, of everything that I am: Japanese anime and toys, my love of punk rock and pop culture, and especially the defining 1970s bands of New York City,” says Cafiero. In a recent interview with Alternative Press Magazine, Marky Ramone was quoted on Osaka Popstar’s debut CD saying “it’s one of the best albums that I ever played on”, while his predecessor, Ramones founding member, original drummer, producer and co-author of classics like “Blitzkrieg Bop”, Tommy Ramone, was quoted commenting on the Live CD: “This is a great sounding live show, which includes excellent performances of several classic Ramones songs.” Other high profile endorsements include guitar icon Kim Thayil (Soundgarden). Thayil’s highly influential guitar work pioneered the Seattle Sound and grunge movement earning him a slot on Rolling Stone’s “100 greatest guitarists of all time. When asked what he’d been listening to lately, during Sub Pop’s Grunge summit, Thayil cited “Osaka Popstar”. Osaka Popstar has since the beginning been almost as much about visual art as it has music, and both releases feature work by a team of colossal visual artists hand-picked by Cafiero and assembled to create an over-the-top, high-energy-bursting-with-color world for the band. The debut LP packaging included work by original Topps bubble-gum card guru John Pound (Wacky Packs artist and creator of the Garbage Pail Kids); Space Monkeys designer and urban legend Dalek; Batman and Justice League wizard Butch Lukic; and Tragnark, who worked closely with Cafiero in developing the “Shaolin Monkeys” character designs, based on the original Osaka Popstar tune of the same name, (planned for a forthcoming animated series). A die-cut, 10-inch shaped picture disc maxi-single for “Shaolin Monkeys” from the debut CD was released in limited edition, available at Hot Topic stores and other retail outlets worldwide. On Rock ‘Em O-Sock ‘Em Live! Topps bubble-gum card creator John Pound returned after he, and Topps alike, received a very enthusiastic response from the public for their involvement with the first album. John not only designed the album cover art for the mini LP, but each limited edition Rock ‘Em O-Sock ‘Em Live! digipak includes an exclusive Topps “Garbage Pail Kids” collectible trading card depicting the full band in concert. Osaka Popstar was honored with inclusion in the Topps bubble gum company’s all new seventh series of Garbage Pail Kids stickers and trading cards, and Cafiero was asked to write the theme song for a GPK animated series, (to be recorded by Osaka Popstar). Osaka mascot and star of the animated music video “Wicked World”, the Devil Dog debuted as a vinyl figure in 2008 at the NYC Comic Con in Clear Red Vinyl and solid white vinyl. Both editions quickly sold out completely via the Osaka Popstar online store and select retail locations. The most recent editions of the vinyl figure include the Skeleton Suit and Candy Corn Devil Dogs, both of which were featured items available worldwide in the designer toy and collectibles section of Previews, the comic shop catalog. The Devil Dogs were designed by Japan native animator/illustrator Mari-chan, based on concepts and characters created by John Cafiero. The high-end, glossy vinyl figures were made in Japan by Secret Base and sculpted by Betch (Pushead Skullpirate). The Osaka Popstar Devil Dog art show debuted on Halloween 2008 at The Showroom Gallery in NYC benefiting animal rescue. Nearly 100 artists from all over the world (including Obey Giant’s Shepard Fairey, Nickelodeon’s “Invader Zim” creator Jhonen Vasquez and Japan’s Rockin’ Jelly Bean) along a few celebrity participants (including actor/comedian Seth Rogen, actress Rose McGowan and writer/director Robert Rodriguez), customized white vinyl Devil Dog toys into one of a kind toy works of art, with net proceeds raising over $5,000.00 for the Picasso Veterinary Fund, (administered by the Mayor’s Alliance for NY’s Animals). In other collaborations, Osaka Popstar teamed up with The Hard Rock Café to offer a limited edition set of cloisonné pins and key chains available exclusively at all Hard Rock Café locations throughout Japan. Collectors seeking the entire set visited all eight Cafés (Tokyo, Osaka, Narita, Nagoya, Fukuoka, Universal Citywalk, Uyeno & Yokohama) for the piece exclusive to each. Animated music videos directed by cult animators Mari-chan (Japan) & the UK’s Joel (Rather Good) Veitch have be seen on a regular basis on the in-house programming at Hard Rock Café locations worldwide. The quirky, aforementioned animated music video for the band’s first single “Wicked World” was voted #1 on Fuse TV’s Oven Fresh in competition against Jack White’s Raconteurs, Buckcherry and other top 40 artists. The “Wicked World” video has since been sought after and licensed to make the leap onto (or off-of) both the big and small screen for release in high definition 3-D by Lucid Dreams 3D and Passmore Labs.